With swords-n-costumes battle epics, a new film within the genre has to be something special. It has a great number of well-worn conventions and a prolific recent history; after Braveheart, Gladiator, and The Lord of the Rings, we’ve seen the rousing speeches, the hordes of armies rushing at each other, and the splattery bloodshed countless times. It’s why movies like Kingdom of Heaven, Alexander, and even modest hit Troy were failures: same old stuff we’d seen time and again. 300 promised, at the very least, stunning CG visuals. This is why it’s going to be a huge hit. But it’s also got a good story to it and compelling action. Zach Snyder, who directed the excellent remake Dawn of the Dead, shows a visual flair behind the camera that’s missing from many so-called “hip” flicks that resort to strobe-light editing to make a movie feel exciting. 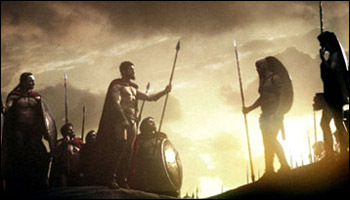 In one the great underdog stories in history, 300 depicts The Battle of Thermopylae in 480 B.C. The Persians are the race of conquest at the time, led by Xerxes (recent Lost addition Rodrigo Santoro), who wants to topple Greece. Sparta, widely known for its brave warriors, is led by King Leonidas (Gerard Butler) and his wife Queen Gorgo (Lena Headey), and they won’t go quietly. Unfortunately, Leonidas has to deal with a corrupt political system, the old men who uphold the old laws won’t allow a battle, and an important political figure, Theron (Dominic West), is making deals with the Persians: riches in exchange for submission. So, Leonidas has to gather the best men he can find and basically break the law, engaging in battle with the superior-numbered attackers, meeting them in the mountains with a bold strategy to take the endless Persian hordes on, only 300 men strong, getting some mild help from the Thespians. The battles are wonders to behold. True, a lot of it is the same kind of bloodshed we’ve seen before, and Snyder has a liberal use of slo-mo, but there’s a great method to all this madness: never once was I confused as to what was going on, and that usual rapid-fire editing you see in most battle films is nowhere present. Snyder prefers longer takes with tricky camera moves and CG enhancements that engulf the viewer in the experience. My jaw drops at how well-composed this film is. With the exciting visuals serving as enhancements to the story rather than upstaging it, for once I can talk about the visuals being worth a damn rather than expressing my disappointment that there was nothing else to savor. Add to that, Gerard Butler’s he-man performance. Believe me, you’ll want to go to battle with him. 300 is a mind-bogglingly cool experience. To me, this destroys Pan’s Labyrinth and especially the last Frank Miller adaptation Sin City. This is the right mix; this is why we go to the movies. No kidding! I figured this one was ripe for criticism. Glad to see there’s something out there worth watching this Spring. Yeah, this is getting nothing but high regards it looks like. With the wife in town, probably won’t be able to drag her to it, plus we’re supposed to go see Zodiac. But I will definately be checking it out next week; I could use a good, solid action film. Thanks, RF. I was poised to hate this movie, which is a testament to its strength since it turned me around. I think we can celebrate pure excitement at the movies, even if a certain flick may have “flaws” or whatever. This is one of those kind of movies that just make you giddy watching. Glad to see you liked it. I’m usually skeptical of films that are heavily promoted on their “visual spectacle.” So often the story or performances (or both) suffer in the pursuit of stunning visuals. Glad to hear this is enjoyable, though I’ve read that it’s one of the bloodiest films ever. Sorry, this one’s not for me. I though it was over-hyped and completely undeserving of all of the attention - average at best. A 2-hour gimmick that wears off after 30 minutes and become completely annoying after an hour and a half. If they played the movie without the slow-motion, it would probably clock in at half the time! Wow, I’m shocked you didn’t like this Brandon, you being a big Sin City fan. But, I hated that movie so I guess we have different ideas of how these CG movies should work. I’ve heard your reasoning from others who didn’t like this film so obviously you’re not alone.